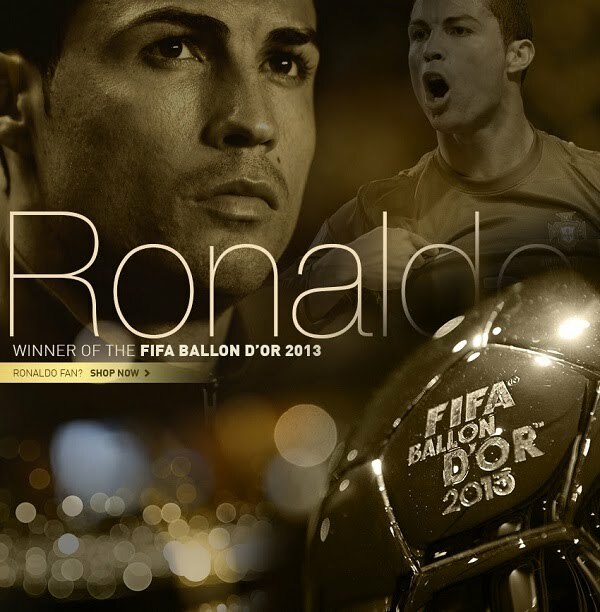 Cristiano Ronaldo has won the 2013 FIFA Ballon d'Or at an awards ceremony in Zurich, ending Lionel Messi's four-year reign as holder of the crown. Real Madrid forward Ronaldo clinched the prize for the world's best player for the second time in his career after finishing ahead of Barcelona playmaker Messi and Bayern Munich winger Franck Ribery in the voting. Ronaldo had finished runner-up three times in the past four years to Messi since winning both the Ballon D'Or and FIFA World Player of the Year in 2008, before the two trophies became one. Portugal captain Ronaldo has been in phenomenal goalscoring form and in 2013 he netted 62 goals in 52 games for club and country. That was not enough to help Madrid pick up any silverware or lead Portugal to an automatic qualifying berth to this summer's World Cup finals, but he did produce a number of memorable individual performances. Among them was in the World Cup qualifying play-offs when he struck all four goals - including a brilliant second-leg hat-trick - as Portugal beat Sweden 4-2 on aggregate to book their spot in Brazil.